Well in the end, we decided not to trash the house. We made a bit of a mess, but nothing too much. In the end, I think the 2-foots were just so pleased to see us, that we could have got away with ANYTHING! The food was pretty good last night too, we had some nice spring greens, some salad, some celery, a carrot with a green top, some toast, and some DRIED APRICOT!!! Oh we have never had dried apricot. We take it, it is very scrummy? 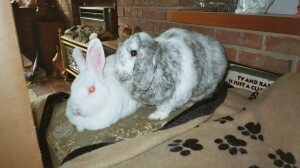 PS - Thank you for the lovely picture of yourself and Flopsy Girl, you both look very snug. Sometimes it is good to be good :-) We are glad that you are free range and we hope it stays that way - you must both be very happy to be free range and get dried apricots as well :-) You are both very lucky - let's hope that you get to stay out all of the time now - won't that be wonderful?